The information that is tracked are edits, suggested edits, close votes, reopen votes, deletion by the system (a.k.a., the roomba) and deletion by users. Since the API does not return deleted questions, the tracking logic considers a question is deleted when it is not returned by the API anymore. To distinguish between a manual and a system deletion, it performs a best guess based on the roomba logic. Progress is monitored and updated every hour. Each question has its history throughout the burnination stored (date of a retag, date of a closure...). When an edit, or a suggested edit, is made to a question removing the tag being burninated. This helps to track which questions were edited and potentially act on wrong edits or users on an edit-spree. Closed: Codeigniter on Godaddy results in 404 removing index.php, GoDaddy issues with directory (differences with "webroot" and "root"), godaddy shared hosting NICE command path and PHP path. The chat bot head quarters is the SOBotics chat room. It can handle multiple burnination efforts at the same time but there can only be one chat room for a given burninated tag. Here's a recap of the efforts so far for [godaddy]: Total questions (1563), Retagged (261), Closed (1213), Roombad (287), Manually deleted (101). This command queries all posts that are eligible for deletion. It queries posts that have a score <= -2, are closed since more than 2 days and have at least one answer. It also returns posts with pending delete votes. Burnination(Id, Tag, StartDate, EndDate, LastRefreshDate, MetaLink, RoomId) - This table holds meta-data for the tag burnination itself. The roomId corresponds to the chat room being the head-quarters of the burnination effort. BurninationQuestion(#Burnination, QuestionId, Title, Link, ShareLink, Score, ViewCount, AnswerCount, CommentCount, Locked, Migrated, Answered, AcceptedAnswerId, Tags, CreatedDate, ClosedAsDuplicate, DeletedDate, LastEditDate, CloseVoteCount, ReopenVoteCount, DeleteVoteCount, UndeleteVoteCount, Closed, Roombad, ManuallyDeleted, Retagged) - This table is a snapshot of the state of all the questions at the current date and serves as base for notifications. All of the information stored is necessary to determine if a deletion probably occured from the system or from users. BurninationQuestionHistory(#BurninationQuestion, EventDate, EventType) - This table holds the history for a given question in a tag under burnination. The events corresponds to closed / retagged / deleted and so on. 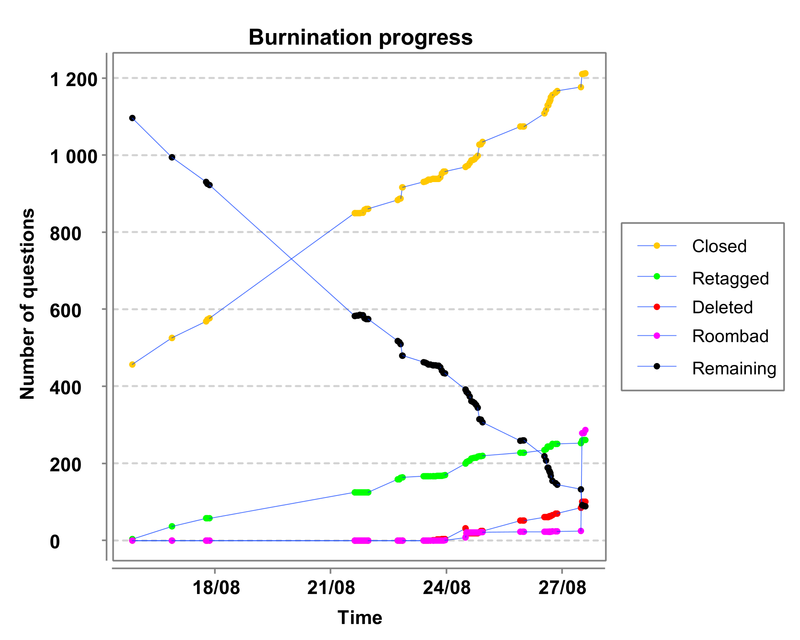 BurninationProgress(#Burnination, ProgressDate, TotalQuestions, Closed, Roombad, ManuallyDeleted, Retagged, OpenedWithTag) - This table holds the progress made at a given date. It will be updated automatically every hour based on the current state of BurninationQuestion. The bot runs under the user Burnaki and sits 24/7 in SOBotics chat room. Source code is available on GitHub at https://github.com/SOBotics/burnaki. This application is currently in semi-production phase. All of the features above are implemented and work correctly, apart from suggested edits that needs further thought (with regard to API quota). Browse other questions tagged app api-v2.2 .